On National Sorry Day, Tues 26 May 2015, the Menzies Centre for Australian Studies at King’s College London, in association with the Royal Anthropological Institute, hosted a screening of Trevor Graham’s award-winning documentary about one of Indigenous Australia’s most famous land rights activists, Eddie Mabo. Mabo: Life of an Island Man builds upon Graham’s earlier film, Land Bilong Islanders (1990), about Mabo and the court case that made his name. It compellingly weaves together his personal life with the landmark High Court ruling of 1992, which deemed an Indigenous system of land ownership, or Native Title, to have preceded colonial rule. Such a ruling set a seismic legal and political precedent which resonates across Australia to this day. 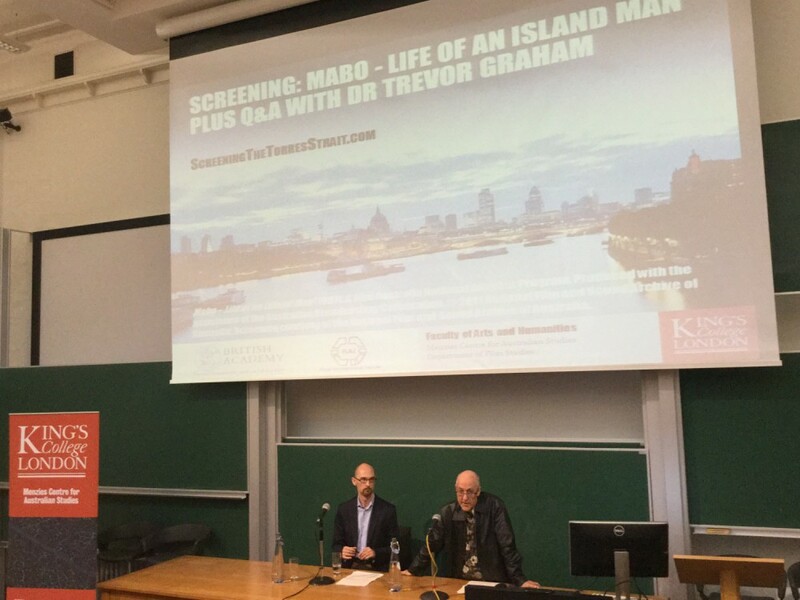 Dr Trevor Graham is an award-winning documentary writer, director, producer and editor who has been at the heart of Australian documentary film-making for more than 30 years. His other film credits include: Painting the Town (1987, winner of the 1987 Best Documentary Award, Australian Film Institute), Aeroplane Dance (1994; winner of the 1996 Basil Wright Award at the Royal Anthropological Institute film festival) and Make Hummus Not War (2012, winner of the Special Jury and Peace Awards at the 2013 International Film Festival). Mabo: Life of an Island Man won Best Documentary Awards from the Australian Film Institute and the Sydney Film Festival as well as the NSW Premier’s History Award and the NSW Premier’s Award for Best Screenplay. The Q&A was followed by a reception in the Anatomy Museum. Mabo – Life of an Island Man (1997). A Film Australia National Interest Program. Produced with the assistance of the Australian Broadcasting Corporation. © 2011 National Film and Sound Archive of Australia. Screening courtesy of the National Film and Sound Archive of Australia.